Slim Jim Trash Cans are among the most commonly spotted restaurant and janitorial supply items. They are also spotted at casinos, banquet halls, hotels, restaurants or even at theme parks. Eventually, these trash cans take a beating. Garbage disposal is often harsh on such trash cans and their body starts to suffer heavy wear & tear. Such unsightly garbage collection cans can ruin any ambiance, become the big sore spot at your professionally hosted event. This is why event managers often choose Premium Spandex Slim Jim Trash Covers—functional and aesthetic, they present an easy way to boost the trash can’s lifecycle and allow ageing cans to be used at any event. These spandex covers are easy to slip on garbage cans. Spandex Slim Jim Trash Covers use a smart fabric blend that does not easily succumb to regular and negligent use. The stretchable fabric ensures every cover tightly envelopes the trash can without creating creasing or gaps. An integral part of any event that hosts a gathering, trash cans often tend to stick-out with their dull colors. Exclusively made from wrinkle-free spandex material, these Trash Cans Covers are much better looking. Now available with more color diversity, they are an ideal addition to restaurant, casino, or a catered event. 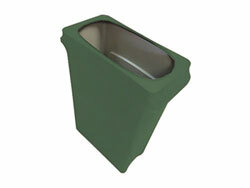 Widely purchased by catering suppliers, hotel managers, and restaurant owners, these covers are specifically made for standard 23-gallon garbage cans (10"x21"x28"). Why buy Commercial Linens & Event Hosting Accessories from RazaTrade?